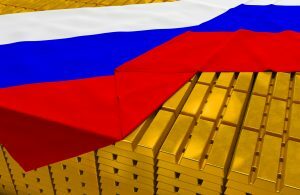 In August Russia’s central bank added another 500,000 ounces (15.6 tonnes) of gold to its reserves, closing the gap on China to less than 100 tonnes (officially reported figures). Russia’s total gold reserve is around 1,745 tonnes (China—1,842.6 tonnes), although China’s true figure may be more. In 2017, Russia has added just short of 129 tonnes to its official gold reserve figure. It seems that the officially stated China total, when it last reported its gold reserve tonnage to the IMF, understated its real reserve position. China has a record of reporting static gold reserve numbers for periods of 5 or 6 years and then updating them when it sees fit, but is even then still widely believed to be understating its true gold reserve figures. One theory is that if China gave the true numbers it would boost the gold price, which China prefers to control until its target gold reserve is reached. This could be upwards of 8,000 tonnes to match the US’s 8,133.5 tonnes. Given that China is setting up a process to pay for its oil imports in yuan, then making these payments redeemable in gold on Chinese exchanges, building a larger gold reserve makes sense, particularly as the US Treasury Secretary has threatened to cut China off from the dollar financial system. China and Russia believe in the value of gold in an era where the US dollar’s power as the global reserve currency is beginning to wane. Gold does not carry the same kind of counterparty risks that fiat currencies do, and is acceptable as money virtually the world over. Russia has been adding to its gold holdings for around 10 years, and recently at around 200 tonnes per year. It is on target to add a similar amount this year. Along with Kazakhstan, it is one of the few nations reporting consistent gold holding increases on a monthly basis, but there is speculation that others may be adding to reserves too (notably China).